• These malformations occur very early in pregnancy (2nd to 3rd week), when the vascular bed is constructed. • Because the malformations remain present they may, in the course of life, give rise to a brain hemorrhage. This is known as secondary brain hemorrhage; stroke by vascular abnormalities. 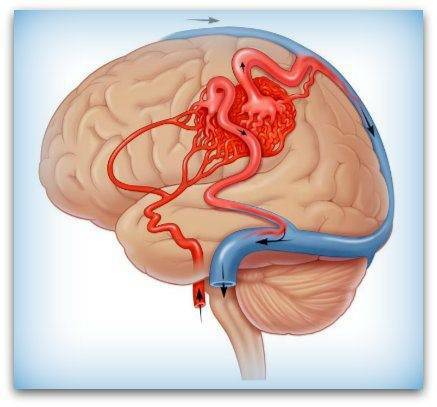 • A rupture of a blood vessel by a bulge (aneurysm) belongs to the secundary stroke, so caused by vascular abnormalities. • The AVM, vascular malformation, may also be revealed by an epileptic seizure. • It can also remain undetected all life. • Approximately three-quarters of the cases will benefit from surgery. • When the tangle is located too deep, is too big or too inaccessible, it is not possible to operate without damage. Resources: Sources: J.B.M. Kuks, J. W. Pike, H.J.G.H. Oosterhuis. Clinical Neurology 15th Edition, Bohn Stafleu Of Loghum, Wood, 2003, Heart Foundation, Dutch Society for Neurology, www.neurologie.nl, heart hand, codex physician tenth pressure, cerebral Foundation Netherlands, Dutch Association of Neurosurgeons, Heliomare, neurochirugen zwolle, http :/ / www.nvvn.org / patient info / cer avm.php.